Ultrafiltration (UF) produces a high quality effluent, devoid of nearly all TSS (Total Suspended Solids), FOG (Fat Oil and Grease) and other contaminants such as Dissolved Metals. 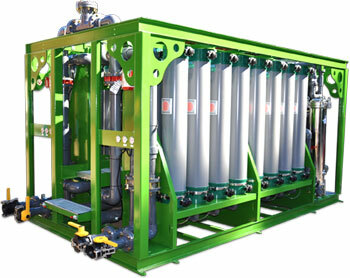 It is frequently the preferred choice of filtration after Dissolved Air Flotation (DAF) and prior to Reverse Osmosis (RO). 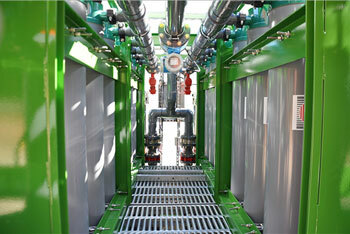 The design configuration is based upon the chemical analysis of the wastewater content and the desired effluent quality. Size can range from 25 to 2500gpm or more. UF filtrate (clean water) can be further treated by RO to take out salt and other dissolved solids. The system can also be equipped with 100% redundant capacity, allowing the plant to continue full treatment even when one skid requires backwashing or maintenance. The entire system is operated by an automated PLC control system. During the ultrafiltration process, inorganic salts will pass through the membranes and organic matter will be retained on the membrane surface or removed in the concentrate stream.